We Had Our Meeting With The City, Now What? The public meeting my neighbors and I requested to express our concerns about the proposed Alki 11 rowhouse project was held last Wednesday, July 17. We had a good turnout - my guess is between 50 and 60 people. This was a SEPA meeting and we were directed to offer comments on environmental issues only. Initially, 12 people signed up to speak, but as the meeting went on, a few more signed in and spoke. Close to 20 people had their say. Topics included those covered on this blog: lack of stormwater mitigation, more cars parked on the street, more congestion, inadequate infrastructure to handle all the waste and stormwater, the potential for flooding, and contributing to sewage overflows into Puget Sound. Older residents who have lived here for many years, some whose family has had property here for generations, talked about how this project fails to consider the character of the neighborhood. Several people reviewed the developers SEPA checklist and pointed out inaccuracies and incomplete answers. Others lamented the loss of wildlife habitat, challenging the developer's statement that there is no wildlife present in this area. Lack of green space, and blocking light and air for neighboring properties was mentioned, as was the lack of transit options available here. Between the oral and written comments, I believe we explained the negative environmental impacts pretty thoroughly. The meeting organizer and Department of Planning and Development (DPD) planner in charge of this project, Tami Garrett, said that she would be reviewing all of our comments, along with the reviews still to be completed by other planners, before writing her decision. She will accept written comments for about one more week. If you have anything you would like to submit, email it to her at tami.garrett@seattle.gov. Obviously, the sooner she gets comments the better. She will write her decision, it will be reviewed by her supervisor, and then it will be published. She expects this to be done within the next two months. After the decision is published, the neighbors will have two weeks to appeal the decision if we aren't happy with it. The mood as we left the meeting was subdued. We get it. There's not much the DPD can do for us. They don't make policy or write ordinances, their job is simply to enforce the rules. The rules are made by the city council, with input from the mayor. "I am trying to be really, really clear on the permitting process. The Council cannot legally take any action that will affect a permit that has been filed with DPD. There is no action that we can take that will affect or stop the project you are concerned about. Only DPD has the authority to do that. If, in reviewing the zoning, there is a case for changing it, that could apply to prospective projects in the future, but it cannot be applied retroactively." So there you have it, the DPD punts to the City Council and the Council punts the issue back to the DPD. In the meantime, projects like the Alki rowhouses and other egregious developments are sprouting up all around us. At some point, city officials may see that mistakes were made and change the rules, but for now, these projects are going to get built. Once they're here, they're here to stay - for decades - along with the problems they spawn. There has to be a better way to manage growth and development in Seattle. What Does SEPA Mean, Anyway? What Does "SEPA" Mean, Anyway? This question has come up often when neighbors have been discussing the Alki 11 review process. We were told that the project was under SEPA review; that the developer had filled out a SEPA checklist; that the meeting the city was granting us was called a SEPA meeting. But what the heck was SEPA? Here is the definition, taken from the first paragraph of the City of Seattle's Department of Planning and Development's SEPA Checklist. Developers have to fill one of these out as part of the permitting process. "The State Environmental Policy Act (SEPA), Chapter 43.21 RCW, requires all governmental agencies to consider the environmental impacts of a proposal before making decisions. An environmental impact statement (EIS) must be prepared for all proposals with probable significant adverse impacts on the quality of the environment. The purpose of this checklist is to provide information to help you and the agency identify impacts from your proposal (and to reduce or avoid impacts from your proposal, if it can be done) and to help the agency decide whether an EIS is required." Prior to our public meeting last Wednesday, several neighbors reviewed the SEPA checklist the Alki 11 developer filed with the city. They found inaccuracies and incomplete responses which they have addressed in both written comments and in their oral comments at the meeting. If a project in your neighborhood is under SEPA review, this is what it is all about. To access the developer's checklist for that project, follow the instructions here. Fill in the project's Master Use Project (MUP) number. When the records come up, scroll down to find the SEPA checklist. Will the Alki 11 Row Houses Cause Flooding? I've pointed out numerous problems with the proposed Alki 11 rowhouse development. Question is: How could I do it better? I've been thinking about that since the DPD's land use sign first went up in front of the property. And I've come up with a simple plan that takes into consideration what neighbors have said they want to see. It also offers a reasonable increase in population density without compromising the environment. We don't have to trade one for the other. I've highlighted in green type the features of this design that would be an improvement environmentally over the existing rental houses, showing that development can improve, not degrade the environment. Three 3-story duplexes (6 units in all) would replace the three rental houses there now. The footprint of each housing unit would be 20' x 30'. These units would provide housing for 18-20 people, a 3.5- 4x increase in population density. 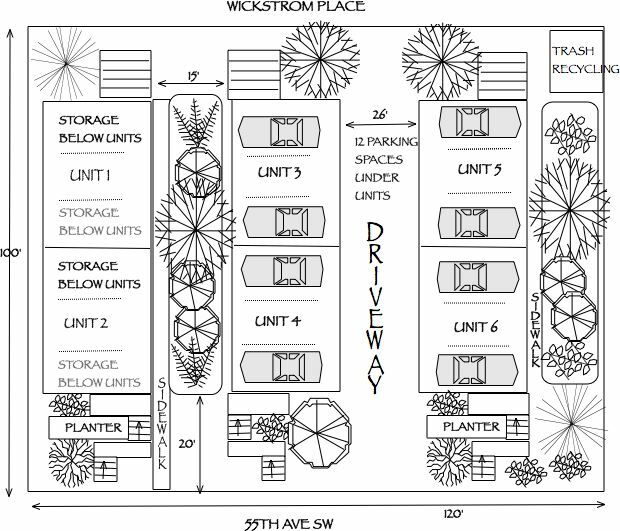 The duplexes would be set back 20' from the street on both the 55th Ave SW and Wickstrom Place SW sides. A total of 12 off street parking spaces would be provided under Units 3, 4, 5 and 6 (see illustration below). This would mean that no cars associated with this property would park on the street. This would be an improvement over what we've had in the past, with at least 3 cars associated with the rental properties parked on street. These would be easy-to-negotiate, green, carport style parking spaces, each approximately 9' wide and 20' long. The parking area would be "green" because the stalls would angle downward slightly toward green spaces, or bioswales, that will capture and filter stormwater runoff that comes across the parking area. All downspouts from the buildings would empty into these bioswales, thus managing all stormwater runoff onsite and keeping stormwater out of the sanitary sewer on Wickstrom Place. This project would have 3,600 s.f. of roof area. One inch of rainfall would result in 2,244 gallons of stormwater coming off those roofs. If the bioswales in this design are at least 6 inches deep, they will have a holding capacity of 4,937 gallons - enough to hold more than two inches of stormwater. There would be a significant increase in the amount of plant material on this site. The bioswales will be mostly shaded by the buildings, thus providing good places for shade loving native plants, including vine maple, red and yellow twig dogwood, ferns, sedges and so much more. Residents will also have garden space to enjoy in front of each unit. This increase in plant material will provide more habitat for wildlife than what currently exists. Our neighborhood has traditionally been home to eagles, great blue herons, osprey, raccoons, opposums, assorted songbirds and river otters. In the past couple of years, as more development has taken place, we've seen a reduction in the wildlife population. One of our two herons has abandoned its nest, the eagle is gone and it has been a while since we've seen the river otters. 4' wide sidewalks along each bioswale will provide easy access for residents taking out recycling/trash, getting in and out of storage units and for gardeners tending to the planting area. This parking arrangement combined with the building set backs will make it easier for residents to see pedestrians and other cars as they exit the parking area, making this much safer than the rowhouse alternative. Residents who have only one car will find that they can easily find a neighbor nearby happy to rent their extra space because many rentals do not have off street parking. Permeable pavement would be used for the driveway and parking area thus reducing the percentage of impervious surface on this site to 25%, as compared with the ~45-50% currently and a huge improvement over the 73% that would happen with the Alki 11 proposal. A total of 6 locked storage spaces, located under Units 1 and 2, would be created. Each would measure approximately 9" x 18'. 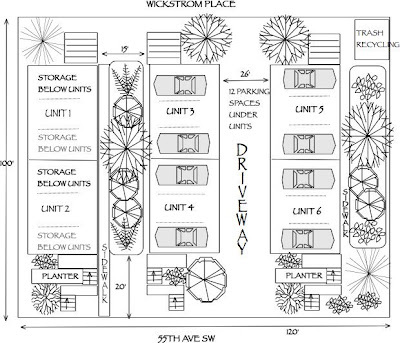 The layout of this plan would make it easy to add bicycle parking on both the 55th Ave and Wickstrom sides. The buildings would probably top out at about 35', below the 39' limit allowed. This could allow room for the installation of solar panels on the rooftops. The drawing below shows how access to the parking area would work coming in from the 55th Ave side. The same configuration would be used on the Wickstrom end. 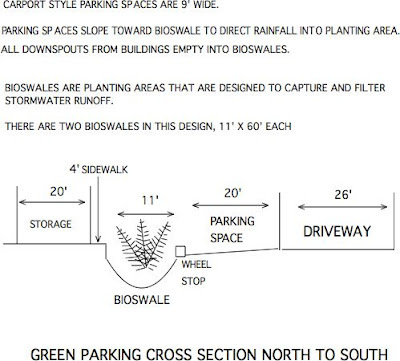 This drawing shows a cross section of one of the bioswales and one side of the parking area. 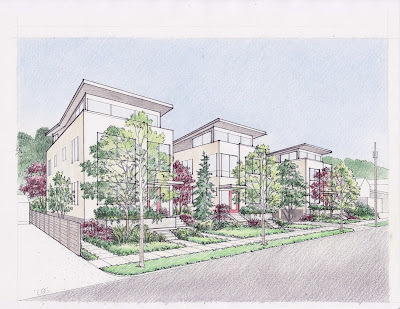 This beautiful rendering, drawn by my talented neighbor, Lynn Shimamoto, shows how this plan for higher density, sustainable housing might look. I don't expect for a moment that the developer of the proposed Alki 11 rowhouses will adopt this plan or even take the time to read this post. But I have very much enjoyed thinking about how this could work, taking into the consideration the neighborhood, the need to make better use of the land we have and the need to protect the environment that we so appreciate and enjoy at Alki Beach. Drawing of the alternative "Alki 6" as it might look from 55th Ave SW.